During Bible Expositions and Church services, biblical verses are displayed on big screens for all to see. Good News is best shared. MCGI’s dedication in sharing God’s words in the Bible to as many people as possible can be seen in the number of ways the Church uses the different mass communication channels of radio, television and the Internet. Under that light comes this blog about the organization’s live symposium-like service: the Bible Exposition. Featuring questions from people and answers straight from the Scriptures, this blog aims to help those who might have missed the event or its live-blogging on Twitter via @AngDatingDaanTV and @TheOldPathTV. In this blog, readers will find Q & As or topics culled from past Bible Expositions that can shed biblical light on problems or happenings in society today. The blog hopes to be in line with Bro. Eli and Bro. Daniel’s goal to bring back Bible-reading in the lives of many. It was in 1993 when Bro. Daniel Razon’s idea to invite family and friends to a gathering where they can enjoy dinner together and have Bro. Eli Soriano entertain any question they may have about the Bible and its Author started. Although Bro. Eli has been answering live queries of faith on radio and television since 1980, it was when the Bible Expositions took off that made many more people aware of the International Evangelist and his Tagalog program, Ang Dating Daan (The Old Path). Leaving the rest to history, the Bible Exposition now caters to a global audience and is served in different languages. The MCGI Leaders’ rich collection of Bible Exposition material throughout the years plays over its 24/7 channels: TV Verdade (Portuguese), La Verdad TV (Spanish), and on the recently acquired Truth TV (English). Online, Bro. Eli blogs the Bible’s reasons behind various happenings and realities in life through his award-winning Esoriano.wordpress.com. 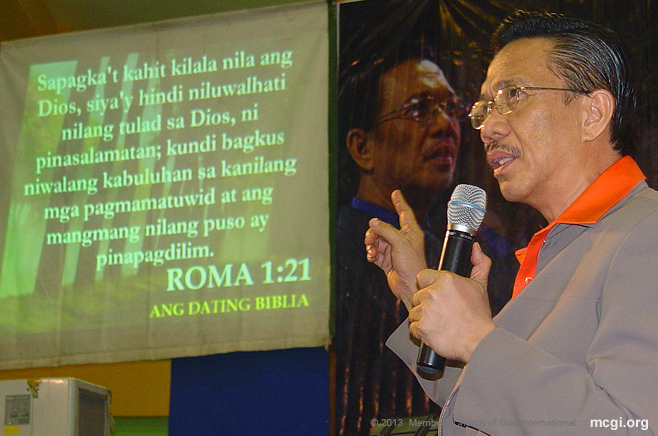 The multi-awarded evangelist also tweets the answers to small queries of faith via @BroEliSoriano.